Over fifty years ago, physicist Freeman Dyson proposed an awesome, if slightly insane, idea: That an advanced alien civilisation might construct a massive, energy-harvesting sphere around its star, and bunk up inside. Scientists have never given up on Dyson spheres—we've even conducted a few legitimate searches for their infrared heat signatures. Now, physicists Ibrahim Semiz and Salim Ogur may have an explanation for why we can't seem to find the megastructures. If Dyson spheres exist, they're probably a lot smaller than we thought. Since Dyson first proposed his massive space habitats, scientists have tried to imagine how such structures could physically work. By and large, researchers have focused on Dyson spheres encircling Sun-like stars. But this scenario poses a few major, and perhaps insurmountable, problems. For starters, such a sphere would have to be built at a distance of roughly 1 AU, the same distance between the Earth and the Sun. That means the structure would be utterly massive, requiring huge volumes of material to construct. What's more, the surface of the sphere would experience only minuscule levels of gravity. To live on it, humans would either need substantial genetic modification, or some sort of advanced artificial gravity system, the likes of which we haven't been able to piece together, even theoretically. From "Relics," the Star Trek episode that introduced millions to Dyson spheres. A white dwarf star—the dimmer stellar remnant left over after a Sun-like star swells up and explodes—might be a better option for Dyson spheres. A white dwarf's habitable zone is much closer, so the sphere would end up being significantly smaller. The researchers calculate that a one metre-thick sphere built in the habitable zone of a white dwarf would require 10^23 kilograms of matter, slightly less than the mass of our moon. A Dyson sphere encircling a white dwarf would also have almost Earth-like gravity, according to the researchers' calculations. A small footnote: The researchers estimate that a Dyson sphere surrounding a white dwarf would be roughly 10 ^6 kilometres in radius. 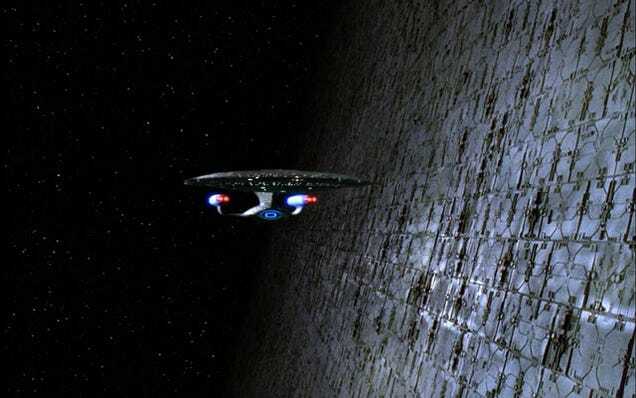 As pointed out by an astute commentator, this puts the newly proposed Dyson sphere within an order of magnitude of the one featured in Star Trek: The Next Generation. It may be new to science, but it seems Star Trek figured this all out loooong ago.